I'm sorry Hana, i am made late, because i don't have time. I know, this wallpaper isn't your style, that you like. But i really like it. Because this wallie is with Miharu! The vector from Miharu is really very simple,from all my vectors is lightest. On the contrary was the background a more difficult. 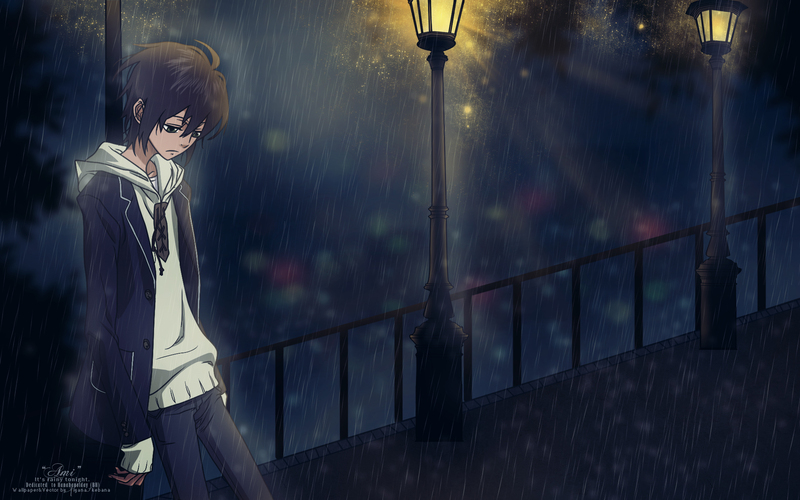 I love the shine and rain effects of the background.I think that,is good or? and then putting soft light. on him, water marks or some indication that he's wet. his whole body, try darkening the lower part, like from his waist. and there but it's a good job and a nice wall to look at. I really like the background, is very well designed. The vector is awesome too, but I think the eyes should be sharper, they look too blurry. It is nonetheless one of the best Nabari no Ou wallpapers, you captured the feeling of loneliness, sadness very well. I don't understand the title though... 'Ame' is the Japanese for 'Rain', if that's what you wanted to name. keep up the good work,and congrats on the elite...it sure deserved it! cool! die elite gallery is gerechtfertigt! the scenery is so sad but at the same time beautiful! Oh yeah...i dont know what i say can. Too you haven't time,cause you was with me in ADV. :) This week was really amazing,and this is truth i haven't long time seen you,i miss you.T_T But now you made me happy with this wall.This is so depressive and i like this feel. What really caught my attention from the tiny thumbnail was the background, that's the real star of this wallpaper! I'm not complaining about the vector, though, it's smooth and simple, but effective. I think I like the street lights best, they seem to give off a strange aura, reminds me of the Narnia books :) Keep it up! kyyyaaa! Miharu is so handsome! well some parts are a bit jagged but i really like the whole concept.